A fine combat system soured by poorly explained complexity, and a lovely looking game let down by a lack of graphics options. While the Roman numeral in the title makes it clear SNK have been busy, the sight of their logo on booting up King of Fighters XIII for the first time is an odd one. They are perhaps more inextricably bound to the 1990s than any other company: the developers of Metal Slug, creators of the Neo Geo, and designers of countless fighting games, none of which were as good as Street Fighter II. SNK aren't quite the same company they were back then – they collapsed into bankruptcy, their best IP snapped up by Playmore, a studio set up by one of SNK's co-founders – but the '90s is still clearly in their DNA. KoF XIII has some of the finest spritework I've seen, and animation imbues each member of the cast with character. It's also set on some beautiful, highly detailed (and often daft) backgrounds. It's remarkably true to the series' roots, a 1993 game with 2013 visuals. Which isn't to say KoF XIII ignores modern fighting game conventions. There's a tutorial, although it's more intimidating than helpful, flinging one new game mechanic at you after another and expecting you to absorb their intricacies in one performance. What the tutorial does make clear is that you shouldn't interpret KoF XIII's four-button control scheme as a sign that this is a simple game. Nor should you expect it to be as beginner-friendly as most contemporary fighting games. There's none of Street Fighter IV's friendly input recognition: your joystick motions have to be perfect. So do your combo timings. Put it this way: King of Fighters XIII is a game with four kinds of jump. Oh, and you have to learn three characters. Unlike other 3v3 games (the Marvel vs Capcom series, for instance), you can't tag-in a teammate during play: the action plays out like a traditional 1v1 fighter, fading to black when a round is over to load your next combatant. This makes for a pleasing mindgame before a match begins when both players select their team's order of appearance, but it's another layer of complexity in a game that hardly needs it. Character-specific combo trials start out helpful and quickly become insane. KoF XIII is still rewarding to play at a low level, but you're always worried that you're missing out on something, and the game is in no hurry to let you in on its many secrets. There is, at least, plenty to do, even for lone players. There's an Arcade mode, naturally, with two infuriating boss battles, and a Story mode with branching paths and fixed team selections. There are combo challenges, time trials and a survival mode. Online there's the usual choice of ranked and player matches, but SNK's pledge that this release would have better netcode than the console versions has proven hard to verify. There simply aren't that many people playing it. Worse, that excellent sprite work is undermined by an almost complete lack of graphics options. You can choose between windowed or fullscreen, fixed or variable framerate, dynamic or static backgrounds, and that's your lot. You can't even change the resolution from the console versions' 720p, and the lack of filters to disguise the jagged edges means that the higher your monitor's display, the worse it looks. 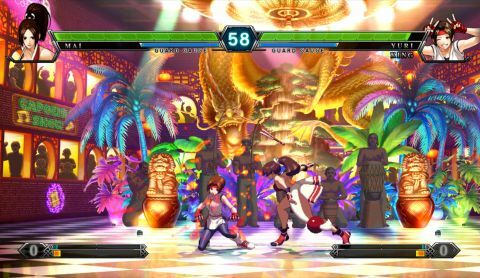 KoF XIII is a disappointing PC port of a decent fighting game.